If you want to get high without doing any drugs go see Blue Man Group at the Orpheum. 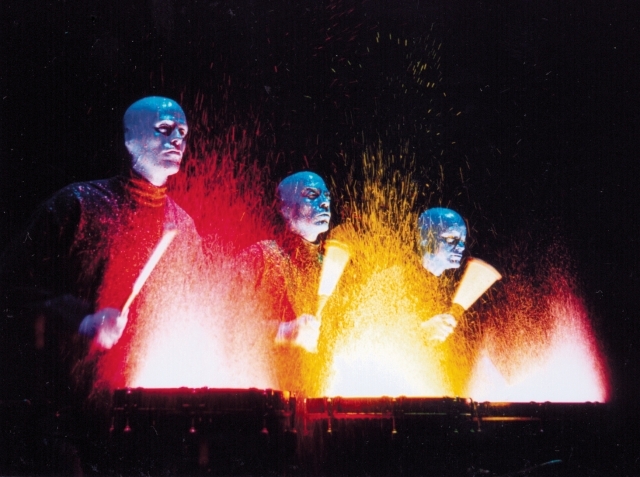 Three kinetic performers with blue faces move like nonhuman organisms in another dimension and even come out into the audience at times. The don’t speak for the 90 minutes duration of the show but express more than thousands of words could. 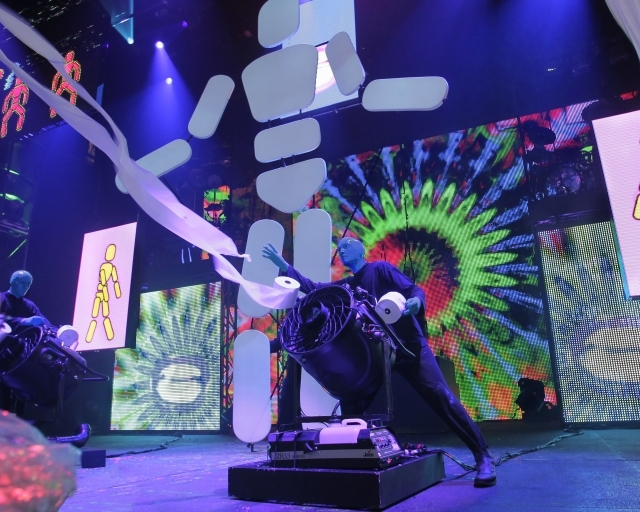 The show is very high tech with swelling electronic sound design by Matt Koenig and lots of gorgeous color splashing not only onto and around the stage but within the props themselves – as in balloons and set pieces. What you thought was white in one scene becomes a kind of flourescent orange in another. Joel Moritz’s lighting, Caryl Glaab’s video design are central to this transporting performance experience. It’s as if they stream us into the collective subconscious. 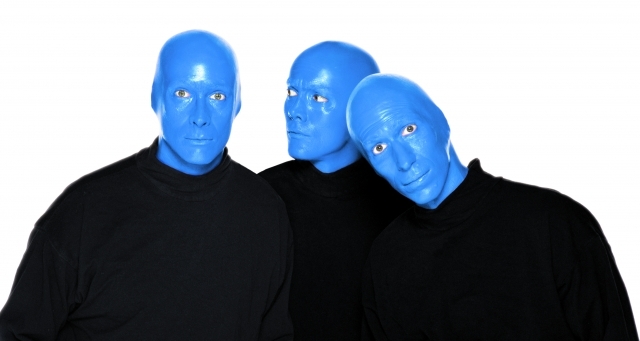 But the paradox about the high tech is that Blue Man Group exudes satirical skepticism about technology itself. There’s a hilarious three screen segment where the men are given a Giant Ipad whose purpose is to make you multitask till you drop or have a nervous breakdown, whichever comes first. To what degree are we driven by consumer capitalism and electronic gadgetry? And how far does that take us away from our real selves. Creator/Writer/Directors Matt Goldman, Phil Stanton, and Chris Wink have created a work that is deeply rooted in contemporary issues while transcending the earthbound plane those issues live on. Amazing, and that’s not a word I throw around. The two sets of Blue Men in Minneapolis are mesmerizingly masterful in skills that range from catching balls in their mouths to drumbeating to moving like jolts of an electric current, and synchronized to boot! They’re simultaneoulsy androgynous, masculine, and sensual. Not quite like anything I’ve seen. They are Kalen Allmandinger, Kirk Massey, Peter Musante, Michael Rahhal, Bhurin Sead, and Brian Tavener. They achieve one of the most unified connections between the human form and technology ever put on stage.